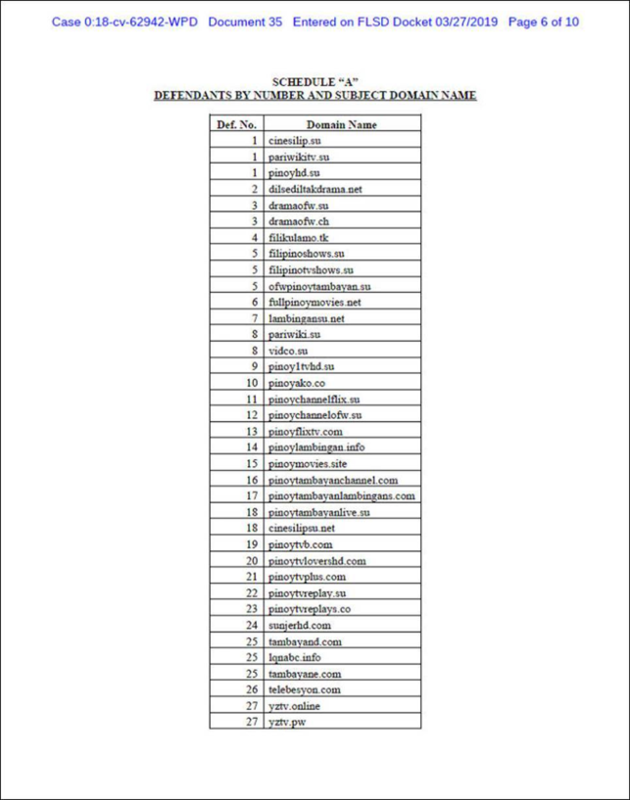 The lawsuit, filed last December 2018, targets more than three dozen domain names, including dramaofw.ch, vidco.su, pinoyflixtv.com, pinoytvlovershd.com, and tambayand.com. 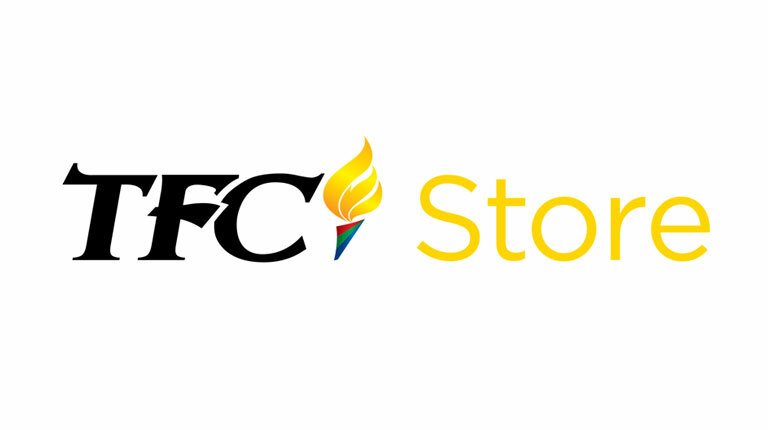 Southern District of Florida, the Fort Lauderdale Division, April 4, 2019 - ABS-CBN, the largest media and entertainment company in the Philippines, has scored yet another legal victory in the United States. The sites in question are streaming portals that offer access to Filipino content in the US and abroad. These sites attract visitors from all over the world, including the United States, where they target people of Filipino origin. 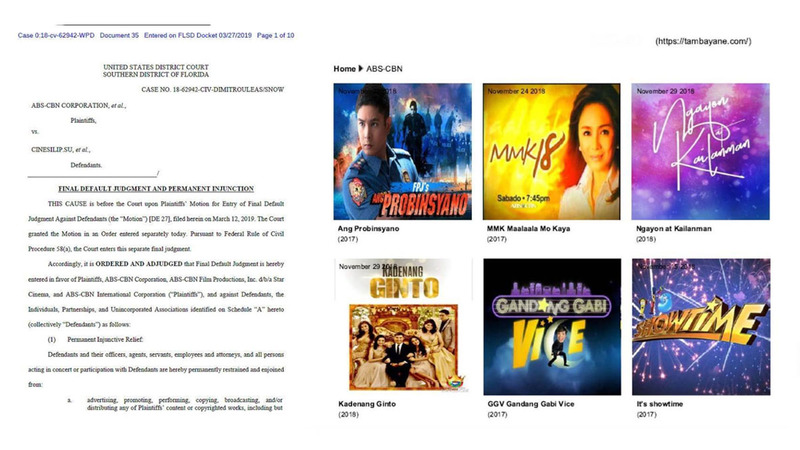 According to ABS-CBN’s Assistant Vice President of Global Anti-Piracy Elisha Lawrence, “Defendants’ websites are operating in blatant disregard of the rights of ABS-CBN and willfully infringing ABS-CBN’s intellectual property. These pirates will be stopped wherever they are in the world”. ABS-CBN’s most recent win follows a pattern of similar verdicts in recent years. With these lawsuits, the company has managed to score dozens of millions of dollars in damages from a wide variety of streaming sites. Further, as part of this judgment, any advertising revenue gained by these pirate websites will have to be handed over to ABS-CBN. The permanent injunction in this judgment also requires the domain name registrars and registries of the pirate sites to transfer the domain names to ABS-CBN.